Copy of photo in Black History Month Exhibit. 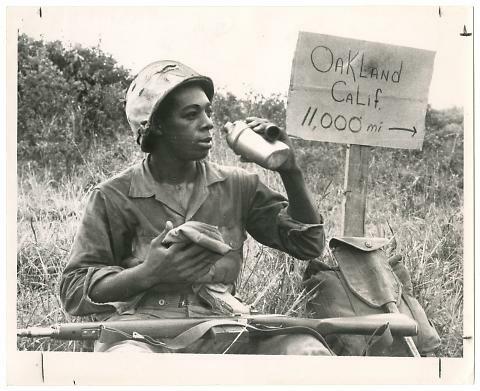 Photo shows an African-American soldier sitting down with his weapon across his lap and taking a drink from his canteen. A sign in the ground next to him says, "Oakland Calif. 11,000"and an arrow pointing to the right. 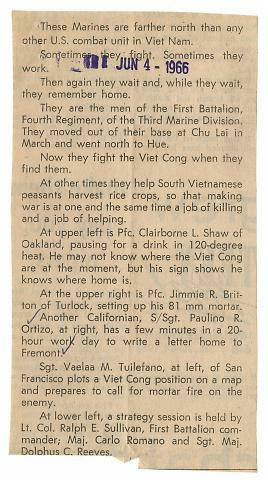 Apparently a series of photos were printed together in the paper with the following caption: "These Marines are farther north than any other U.S. combat unit in Viet Nam. Sometimes they fight. Sometimes they work. Then again they wait and, while they wait, they remember home. They are the men of the First Battalion, Fourth Regiment, of the Third Marine Division. 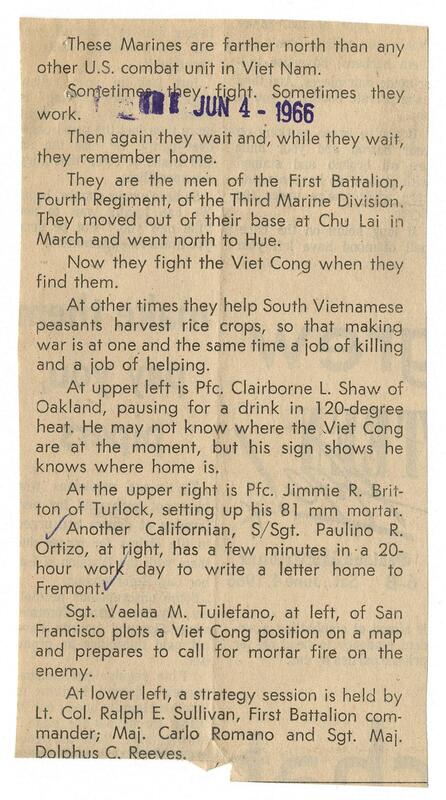 They moved out of their base at Chu Lai in March and went north to Hue. Now they fight the Viet Cong when they find them. At other times they help South Vietnamese peasants harvest rice crops, so that making war is at one and the same time a job of killing and a job of helping. At upper left is Pfc. Clairborne L. Shaw of Oakland, pausing for a drink in 120-degree heat. He may not know where the Viet Cong are at the moment, but his sign shows he knows where home is. At the upper right is Pfc. Jimmie R. Britton of Turlock, setting up his 81 mm mortar. Another Californians, S/Sgt. Paulino R. Ortizo, at right, has a few minutes in a 20-hour day to write a letter home to Fremont. Sgt. Vaelaa M. Tuilefano, at left, of San Francisco plots a Viet Cong position on a map and prepares to call for mortar fire on the enemy. At lower left, a strategy session is held by Lt. Col. Ralph E. Sullivan, First Battalion commander; Maj. Carlo Romano and Sgt. Maj. Dolphus C. Reeves."